While many people visit Japan to explore iconic places such as the beautiful Imperial Palace, majestic Mount Fuji, historic Kyoto, and bustling Tokyo, it also has a one-of-a-kind attraction for winter travellers. 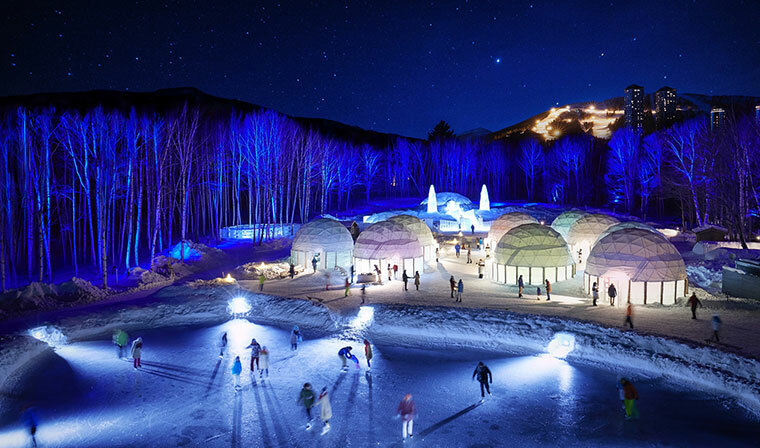 Tucked away in the country’s northernmost island of Hokkaido is an ice village that is open to visitors from December through March. It features an Ice Chapel built entirely from a single piece of ice as well as an Ice Bar, Ice Slides and skating rink. Visitors should be prepared to dress warmly. “Fantastic scenery expands in front of you, which is possible only in the environment of Tomamu where the temperature reaches -30°C [-22 degrees Fahrenheit],” according to the website. The Ice Chapel and Ice Hotel are “the symbol of this mystical icy world” and are accessible via the Ice Street that features domes of ice and walls of snow. The chapel is available for weddings, and its design represents “the unbreakable love between two pure souls which shall last forever.” The entire chapel—the altar, crucifix, and benches—are made out of ice. Fireworks are also provided for the lucky couples. The Ice Books & Café has ice bookshelves, ice chairs and a fireplace encased in special glass so it doesn’t melt the place down. The books are specially selected to offer a “heartwarming experience.” A snack of frozen veggies served on an ice plate with warm cheese is available to take the chill off. The Ice Bar serves more than 50 cocktails in ice glasses (obviously). The drinks are infused with ice cubes made of water from the subterranean rivers of Daisetsuzan Volcanic Group. There are also ice musical instruments for visitors to play, as well as activities for children, including sculpting ice glass and freezing soap bubbles. The ice slides aren’t just for kids, either. Adults enjoy them just as much as the little ones! The ice village opens on Dec. 10, but its official grand opening is scheduled for Jan. 18, 2019. The town shuts down on March 14. Admission to the village is 500yen (CAD$6), while a night at the hotel costs 23,000yen ($267) per person. The accommodations include breakfast at the Ice Books & Café”, an outdoor Ice Bath, after-bath Ice Lounge, hot drinks, sleeping bags, and pyjamas.